Comedy takes effort and it takes practice. At this time of year, numerous practitioners of the art up and down the country are preparing for one event—the Edinburgh Festival Fringe. Which according to Wikipedia is the world's largest arts festival, and for comedians it is a chance to bring an act to a larger audience that if successful will see them take it around the country for the next year. Plus of course, a good review from The Scotsman can really help a comedian’s career. In order to prepare for the Edinburgh Festival Fringe, comedians put on preview shows where they work out and practice their act beforehand. Thus, these are not fully polished acts, so they may not quite work or they may not be quite funny enough. So that was why I attended the Jewellery Quarter Comedy Edinburgh Previews on Sunday July 8th with some trepidation and then some more trepidation for another reason. That second reason was because one of the acts would be about board games. The danger being that the comedian would be making fun of my hobby at the expense of my fellow gamers. That the title of the show was ‘Always Be Rolling: How board games can change your life and save the world’ bode well for the evening. As did the fact that the comedian, James Cook, was a fan and player of board games, and was enough of both to have attended UK Games Expo, this country’s biggest games convention, held back at the end of May. So at least he was going to know what he was talking about and from the title of the show, he was going to be positive about playing games. As it turned out, Cook was positive about games, though not always quite so about gamers, though none of his comments were really unfair. At the core of the act was the hypothesis that as children our enjoyment of games was ruined by having to play bad games—Buckaroo, Guess Who?, Hungry (Hungry) Hippos, Monopoly, and so on. The solution of course, and despite all of our foibles—our love of accuracy, zombies, being inside on a hot day, putting medieval merchants on the front of game boxes—was to play the games that gamers like. This would teach us that games could be fun to play even if you did not win. So games like Carcassonne and Settlers of Catan. Now to be fair, to many of those in the room, he was preaching to the converted, and whilst what he was saying was not wrong, it was obvious. Then again, unless he is going to perform the act at next year’s UK Games Expo, James Cook is unlikely to be performing to more than a dice roll’s worth of gamers at any one time. In addition to the thesis about the benefits of playing board games, there were interactive games and audience participation. I now know that it really helps to have facial stubble if you are going to be playing a live action version of Hungry Hippos with marshmallows instead of little plastic spheres. 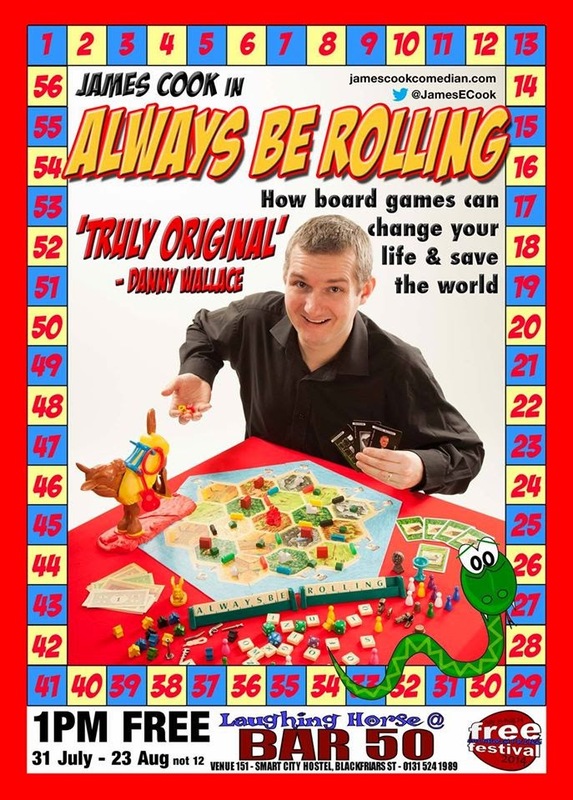 Ultimately, the main criticism that can be levelled at ‘Always Be Rolling: How board games can change your life and save the world’ is that James tells you how bad games can be and he tells you why, but he does not effectively tell you how good they can be. If Carcassonne and Settlers of Catan are as good as James tells you that they are, then we never learn why. The issue there of course, is that James does not have five minutes or a thousand words to explain why they are good. He has to get on and be funny at the same time, and whilst he is, by not telling us how good the games are, he never quite sells the idea that they can change your life or save the world.